Articles at Lift Up: Powerlift Rules! Most of the powerlifters in this article had nothing to do with lifting weights and breaking personal and world records. However, they had a direct impact on earth-shattering progress of the Soviet sports in general and Olympic weightlifting in particular. There are different economic models that run sports organization. Being a less of a commercial sport, Olympic weightlifting utilizes financial support from business sponsorship and club fees to individual donations. History of the US weightlifting remembers Bob Hoffman and his York Barbell Club when an enigmaic multi-millionaire literally ran Olympic weightlifting in the United States for decades making American athletes the best in the world. Weightlifting in the former Soviet bloc - in the USSR, Bulgaria, East Germany, Hungary, Poland, Czechoslovakia, etc. - also were able to reach the level of leading powers in the world of Olympic weightlifting but the economics of sports had an opposite background in its essense. It was a state run sports model and the input of political leaders was decisive in most cases. The following table presents a review of medals earned by the Soviet Olympic weightlifters at the World Championships and Olympics during different power eras throughout the history. The father of Russian revolution and the founder of the Soviet state wasn't really up to sports. The zero medal count truly shows that Olympic weightlifting wasn't exactly on his priority list. Nicknamed by the Western media as "Uncle Joe", Stalin was more well-known at home as the "best friend" of soccer players, gymnasts, cyclists and all other sports disciplines. Weightlifting gets a jump start. Grigory Novak wins the first Soviet world title ever (1946). Soviet Olympic weightlifters turn from regulars at World championships to a leading weigltlifting power. Sport becomes a science with hundreds of research centers, methodologies, training facilities and coaching personnel. World and Olympic champion, Arkady Vorobyev retires from competition to become a lead weightlifting scientist and coach national team CCCP. Medal count steadily goes up. Brezhnev runs the country like one runs on a treadmill - without actually going anywhere. An avid sports fan, he rarely misses competitions and closely follows sports sometimes confusing reality with fiction. Medal count reaches its prime. Superheavyweight legend Vasily Alexeev is unbeatable - sometimes winning the competitions just by giving a tough look to his opponents. Big time fan of Dynamo club sponsored by his former emploees - secret service and police troops. Old-time tough disciplinarian, he didn't forget that somebody boycotted 1980 Olympics in Moscow. The Soviets skip the 1984 Olympics in Los Angeles for Druzhba Cup, break all world records left and right but those have a bitter taste without the Olympic medal weight. No significant changes and no visible initiative anywhere. Power run is too short to even make an opinion on it. The medals are impressive but those are rather due to the previously developed foundation. 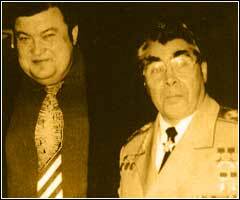 Soviet supers Anatoly Pisarenko and Alexander Kurlovich get arrested in Canada for smuggling steroids. Both are disqualified and their names are wiped out from record books. National coach Prilepin dies of a heart attack. So does Chernenko but rather of natural causes. How long can one run on the treadmill without taking care of wear and tear? Radical repair is on its way. Gorbachev becomes the best buddy of Reagan. So do the athletes. Good time for the stars of commercial sports with massive escape of players to the pro club in the West. Government sponsorship is going down favoring western business model for sports. Olympic weightlifting isn't exactly a commercial venture. Treated as a semi-legal activity in the previous decades, bodybuilding and powerlifting begin to bloom. Thanks to Harvard University economic advisers, transition to capitalism in Russia gets a scientific name - a "shock therapy". The worst time ever for sports overall. Sports foundation gets deteriorated - no investements are made to sports. New economy requires new financing of Olympic weightlifting - it needs Russian Bob Hoffman to take care of it. On a lesser scale, former World Champion Vyacheslav Klokov steps in and pays from his own pocket to boost Olympic weightlifting in the country.